Planning and zoning activities direct development away from problem areas, especially floodplains, wetlands, and naturally sensitive areas. This is done by allowing land uses that are more compatable with the natural conditions of the land. Use of the land can be tailored to match the land's hazards, typically by reserving floodprone areas for parks, greenways, golf courses, backyards, wildlife refuges, natural areas, or similar activities with a low potential for property damage. A zoning ordinance regulates development by dividing a community into zones and setting development criteria for each zone. The zones should be based on future land uses propsed by comprehensive or land use plans. Most communities with a flood problem are in the National Flood Insurance Program (NFIP). They must abide by the NFIP minimum requirements, which are summarized below. It should be stressed that these are minimum requirements. Zone A: The Special Flood Hazard Area, i.e. the area subject to the "base flood" which has a 1% chance of being equaled or exceeded in any given year. the base flood is also known as the 100-year or the 1% chance flood. The base flood is a statistical concept used to ensure that all properties subject to the NFIP are protected to the same degree against flooding. Zone B: Area of moderate flood hazard, usually depicte on older FIRMS as netween the limits of the base and 500-year floods of the primary source of flooding. B Zones may have local, shallow flooding problems. B Zones are also used to designate areas protected by levees and base floodplains of little hazar, such as those with average depths of less than 1 foot. Zone C: Area of minimal flood hazard usually depicted on older FIRMS as above the 500-year flood level of the primary source of flooding. C Zones may have local shalow flooding problems. B and C Zones may have flooding that does not meet the criteria to be mapped as a SFHA, especially ponding and drainage problems. 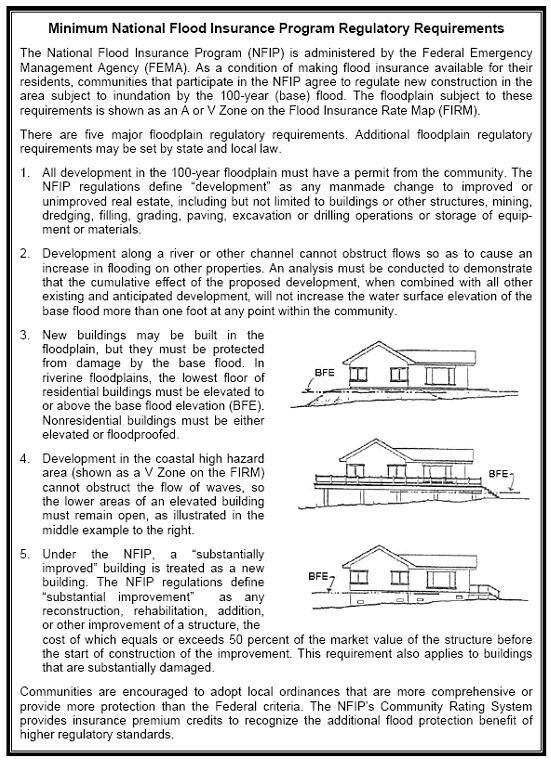 Zone V: The SFHA subject to coastal high hazard flooding. Zone X: Newer FIRMS show Zones B and C (see above) as Zone X. The shaded Zone X corresponds to a Zone B and the unshaded Zone X correponds to a Zone C.
See also Section 8 of the Louisiana Floodplain Management Desk Reference. Your permit office will have the FIRM for your community. Follow these steps to obtain a "FIRMette" for your area.